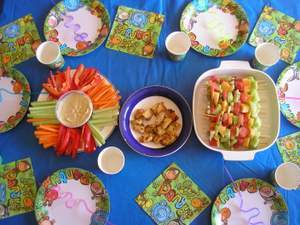 You can provide healthy and enticing finger foods for kids parties. These kids birthday party food recipes are popular, nutritious and easy to prepare. It's a good idea to simply provide finger foods for kids parties. Kids find it difficult to sit and eat for too long when there are fun games to get on with. Finger foods are quick and easy for kids to eat, giving them enough energy to keep going, stay cheerful and not feel hungry. The other advantage is less food is wasted. How many times have you seen plates still half full of food emptied into the bin after a kids party? With finger foods kids can select what they're going to eat now and can continue to graze later if they feel like it. When you give kids healthy choices instead of sugar-laden, artificially coloured junk, you're less likely to have them turn into a sugar-frenzied mob and run wild, fighting with each other and wrecking your house in the process. For the same reason, it's perfectly acceptable to offer kids water only - jazz it up with some fancy curly straws and they'll be happy. Sugary soft drinks will only disappoint the dentist. There's no need to go overboard with kids party food ideas and create a dozen different selections either. You'll only exhaust yourself before the party even begins. After all, you want to enjoy your child's birthday party too. The recipes below can be prepared the day before if they're stored well in the fridge. That leaves you free to run the party games, take photos and video, help open presents, wipe up the spilled drinks and make sure everyone is getting along. These healthy finger foods for kids parties are tried and tested. (Check out the before and after photos.) There's no doubt they were popular, and no-one asked where the lollies were! We did still have a banana birthday cake with licorice spots - you don't want to go to the other extreme and never provide any treats, that will just make your kids more likely to binge when they get older. •	A selection of ripe fruit e.g. apple, orange, watermelon, rockmelon, banana, grapes, mandarin, peach, apricot, pear, kiwifruit. 1. Important: Remember to soak the skewers overnight, or for at least a few hours, so that they don't splinter. 2. Cut fruit into 1-2cm pieces. 3. Skewer 7 or 8 pieces of fruit on each skewer. Tip: When you're estimating quantity, allow 3-4 skewers for each child. Being generous, that's roughly two whole pieces of fruit per child i.e. the size of two apples. Using this rough estimate you can calculate how much fruit to chop up. For example, for 10 kids chop up 2 apples, 3 bananas, 3 kiwifruit, 2 oranges, 1/2 rockmelon, 1/4 watermelon, 2 pears and a bunch of grapes. •	A selection of vegetables kids generally like to eat e.g. carrots, red capsicum, celery. 1. Wash and cut the vegetables into dipping sticks (about 5cm long). 2. Arrange vegetable sticks around the dip. Tip: If you're fussy about double-dipping, add a couple of teaspoons to the dip so that the kids can scoop some onto their own plates. 1. Beat up the eggs in a bowl. 2. Crush rice pops in another bowl and mix with parmesan cheese. 3. Cut breasts into 2cm cubes. 4. Dip each piece of chicken in egg mixture, then coat in rice pop/parmesan mixture. 5. Grill until golden brown. 6. Turn and brown nuggets on the other side. Tip: Get your grilling tray ready and lay the nuggets out as you coat them. The nuggets can be cooked the day before and served chilled or re-heated. Make sure the kids get the first go before the Dads, these finger foods for kids parties are popular with everyone!